Our Pre-school Program is designed for children ages 18 months to 5 years. The program emphasizes learning in a fun, safe environment. Through the use of our state of the art equipment and thematic lesson plans, your little one will acquire coordination, balance, creativity, basic tumbling, and self-esteem. We also begin to teach how to participate and learn in a group environment. These are skills that transfer very well in a school setting. Research has proven that children who participate in pre-school gymnastics tend to do better in reading and have better fine motor skills. This program is a parent/guardian participation class and teaches children age 2 to 3.5 yrs about movement and exercise. Basic components of fitness are emphasized: flexibility, balance, strength, and muscle endurance. You can expect your child to have fun exploring the various stations with you in a 45-minute class including, tumbling on our spring floor, swinging on bars, and balancing on beams. Children who complete our Little Dipper classes are ready to continue their gymnastics grow in our Shining Star program. This program is a parent/guardian participation class and teaches children age 2 to 3.5 years about movement and exercise. Basic components of fitness are emphasized: flexibility, balance, strength, and muscle endurance. 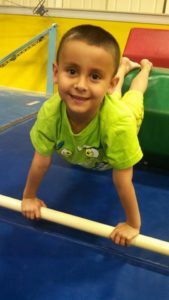 You can expect your child to have fun exploring the various stations, with you in a 45-minute class including, tumbling on our spring floor, swinging on bars, and balancing on beams. Children who complete our Little Dipper classes are ready to continue their gymnastics grow in our Shining Star program. This program is geared for children ages 3 to 4. They participate in a 45-minute class once a week. Each class is divided into three segments. The first is a musical warm-up that includes running, jumping, skipping, and stretching. The second is an obstacle course on our spring floor, teaching the basics for handstands, cartwheels, and somersaults. The third segment combines specialized preschool equipment along with standard Olympic apparatus to establish a foundation in all the gymnastics events. All of our preschool classes end with a song and a stamp for a JOB WELL DONE!! This program is geared for children ages 4+. They participate in a 50-minute class once a week. Each class is divided into four segments. The first is a musical warm-up that includes running, jumping, skipping, stretching, and a position of the week. The second is an obstacle course on our spring floor, teaching the basics for handstands, cartwheels, and somersaults. The third and fourth segments combine specialized preschool equipment along with standard Olympic apparatus to establish a foundation in all the gymnastics events. All of our preschool classes end with a song and a stamp for a JOB WELL DONE!! MGC maintains a low student : teacher ratio to ensure that each child receives plenty of individual attention.